Hi, I’m Cindy from Skip to my Lou! Please come visit me for crafty tutorials, handmade gift ideas, teacher appreciation ideas, sewing patterns and recipes! 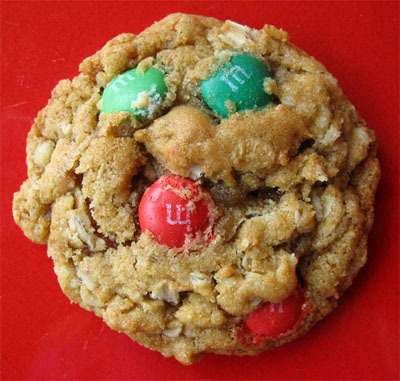 This yummy cookie mix makes a great gift and can be made ahead! I have included some free printable labels to make it so easy! 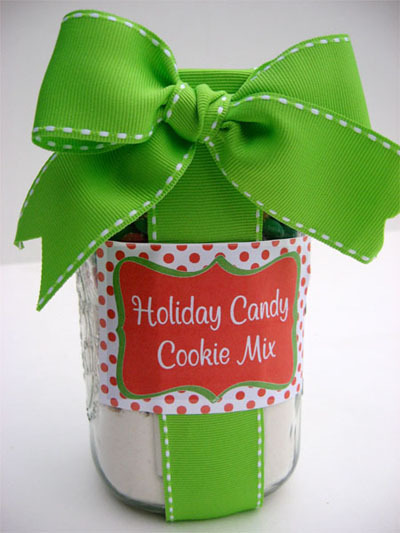 Tie ribbon around the jar, add the label and you have a sweet gift! I hope you like my Holiday Candy Cookies! …only a 114 days until Christmas. If you are needing some handmade gift ideas please check out my Handmade Gift Guide! I love this post. Thanks for sharing tht. Those 114 days will go very fast. Come over and visit. We have a wonderful apple scone recipe this week. Come visit us on facebook too. LIke us and help us get to our goal of 500! what size jar are you using for this? thanks soooo much for sharing. I think this one is a keeper for Christmas gift ideas. This is what I’m doing for all of my friends and neighbors gifts this year. Thank you! It is difficult to tell how much ribbon you use and how you are tying the ribbon around the jar. Do you have any idea how much ribbon you use per jar?